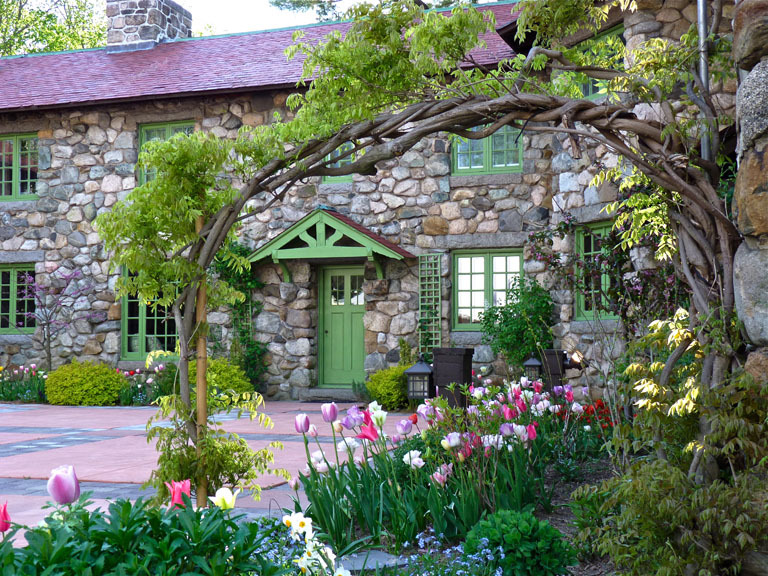 While planting for design clients and organizing plant lists for the class I am teaching at the Arnold Arboretum of Harvard University I thought you would like to know about some of the great shrubs we have been working with. A well-sited flowering and fruiting shrub will often provide at least several, if not four, seasons of beauty; are long-lived (as compared to woody perennials); and provide sustenance and shelter for songbirds, butterflies, and bees. The following are several native favorites well worth considering when planting for people and for pollinators. 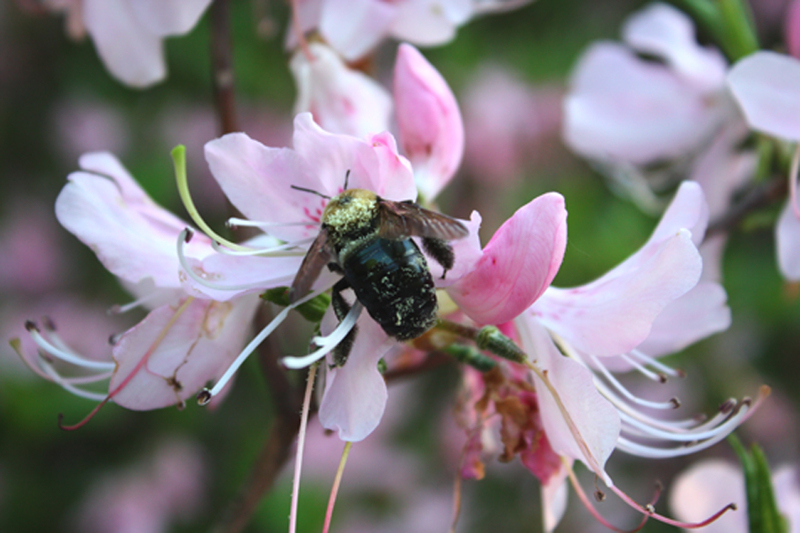 The accompanying photograph is of pinkshell azalea (Rhododendron vaseyi) and the much-maligned Eastern Carpenter bee (Xylocopa virginica), taken in mid-May at the Arnold Arboretum where a stunning massed bank of R. vaseyi is planted alongside the Meadow Road. 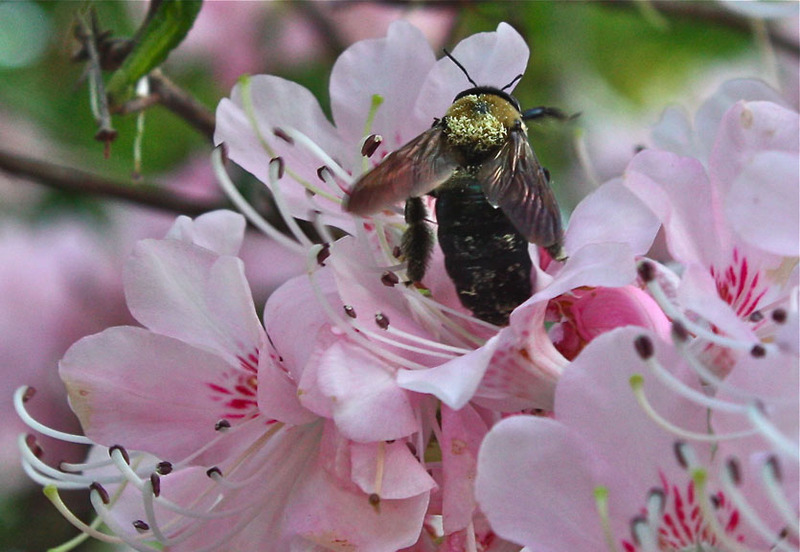 Carpenter bees are an important pollinator for many open-faced spring flowers such as the blossoms of fruiting trees—crabapple, apple, pear, peach, plum, and wild cherry—as well as holly and brambles. The damage done to wood is usually minimal and cosmetic. X. virginica has an especially bad reputation with blueberry growers because they have strong mouthparts (capable of boring into wood), which will easily tear flowers with a deep corolla—blueberries and azaleas, for example. Carpenter bees are regularly mistaken for bumblebees. Their shiny black abdomen most easily distinguishes them, although in the photograph, this carpenter bee was covered in shimmering golden pollen, which could lend a similar appearance to that of a bumblebee. While photographing at the Arnold I observed dozens of carpenter bees and at least half a dozen other species of native pollinators nectaring at the blossoms of the pinkshell azaleas. Pinkshell is a deciduous azalea discovered in 1878 by George Vasey, the botanist in charge of the United States National Herbarium. Named after Vasey by Harvard botanist Asa Gray, pinkshell is found growing naturally in only six counties in the mountains of western North Carolina. R. vaseyi was introduced into cultivation by the Arnold Arboretum in 1880 and is now widely grown. Although able to attain fifteen feet in height, the pinkshell azaleas at the Arboretum are pruned to approximately chest height. The blossoms of pinkshell are typically seashell pink, but can vary from white to reddish-purple. 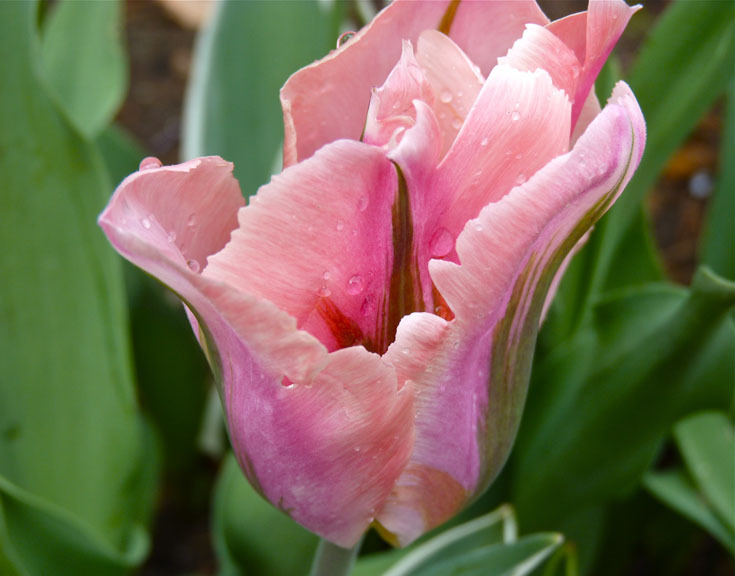 The upper lobes are usually spotted red, but pink, green, and brown spotted blossoms are also common variants. When grown in a sunny location, the leaves turn a striking reddish hue in fall. 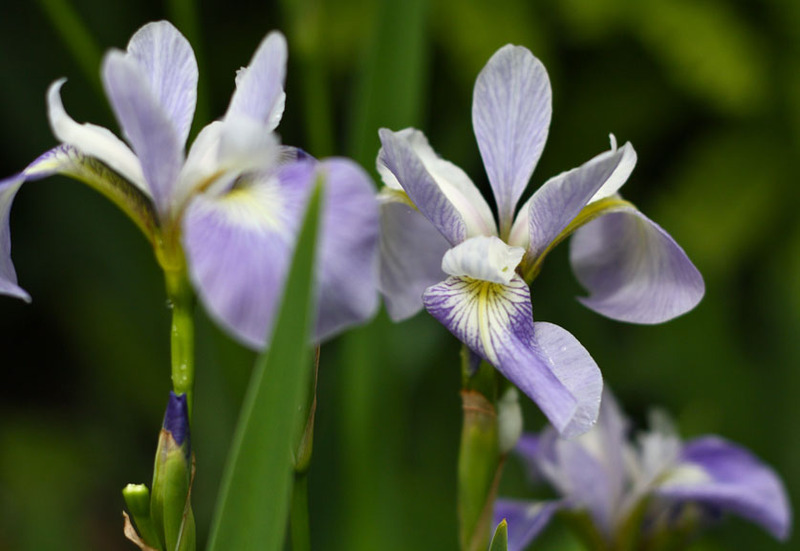 R. vaseyi is very easy to grow and is highly adaptable to a wide variety of conditions from mountain ravines, swamps, bogs, stream banks, and high elevation coniferous and oak forests. At the turn of the previous century, it was once found in the wild in Massachusetts, apparently having naturalized at an abandoned nursery near Halifax, and was growing in a swamp as well as in sandy soil. Native species azaleas (Rhododendron spp.) are a nectar source for the Eastern Tiger Swallowtail butterfly and Ruby-throated Hummingbird and larval host plants for the Azalea Sphinx Moth (Darapsa choerilus). Ilex glabra, or inkberry, is a fine-textured evergreen shrub, often confused with the less cold-hardy Japanese holly (Ilex crenata). Inkberry is found growing naturally along the East and Gulf coasts, from Nova Scotia to Florida and west to Texas. The species form matures at approximately eight feet high and equally as wide, with an upright oval growth habit. The commonly available cultivars, with names such as ‘Compacta’ and ‘Densa,’ are generally more compact, less leggy, and less suckering than the species form. 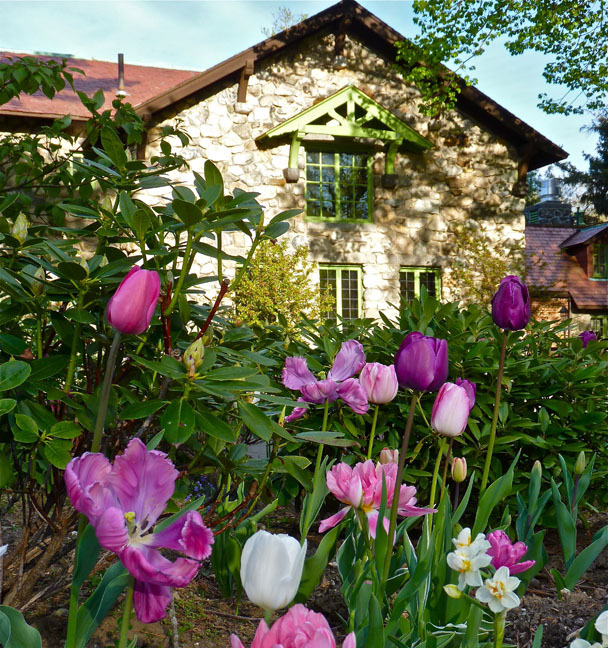 The compact cultivars and species are ideal for creating year-round screening to disguise a neighboring eyesore. With periodic shearing, the plants can be maintained to the desired density. The Atlantic (or Holly) Azure butterfly caterpillar (Celestrina ‘idella’) feeds on the male flowers of Ilex, including inkberry and American Holly (I. opaca). 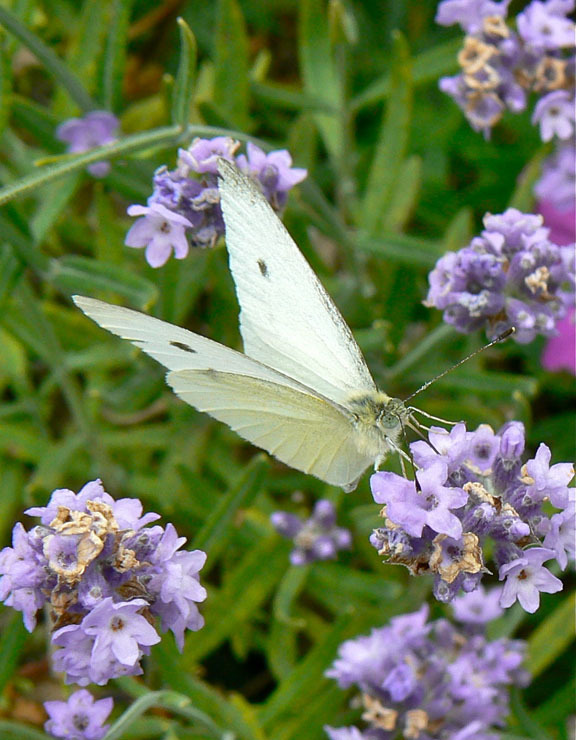 The diminutive cream-colored flowers appear in June on male and female plants. When a male pollinator plant is growing nearby, by September green berries ripen to ink-black berries on the female plants, providing sustenance for many songbirds including the Mourning Dove, Northern Bobwhite, and Hermit Thrush. There is much misinformation regarding which cultivars bear fruit; adding to this confusion is the fact that plants are often mis-labeled. When selecting plants for a client, I make a point of looking for remaining fruit on the individual specimens to ensure that we are indeed purchasing a fruit-bearing plant. Inkberry grows in part shade to full sun and prefers moist acidic soil, but is highly adaptable to soil conditions. To avoid winterburn, in general, broadleaf evergreen shrubs should not be sited in a south-or west-facing exposure, although inkberry performs better than most in such adverse conditions. F. major, it is not, rather F. gardenii is slightly less fragrant. The flowers are also a bit smaller and less showy. Fothergilla gardenii fits the bill when a similar, but smaller than, shrub to ‘Mt. Airy’ is required. As we were planting F. gardenii at Willowdale Estate several weeks ago, immediately a Spring Azure butterfly joined the scene and began nectaring at the blossoms. The summer foliage of ‘Mt. Airy’ is a lovely soft shade of blue-green, turning brilliant red and yellow during autumn—making it, too, a lovely multi-season plant. This entry was posted in Antennae for Design, Bees, Cape Ann, Creating a Butterfly Garden, Home and Garden, Lepidoptera ~ Butterflies, Skippers, and Moths, Life at the Edge of the Sea, Native Plants, North Shore Boston, Wildflowers and tagged Arnold Arboretum, carpenter bee, pinkshell azalea, Rhododendron vaseyii on March 25, 2010 by Kim Smith.